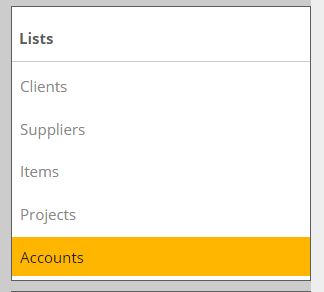 Learn the two different ways you can record reimbursable expenses in Kashoo. Note: This article is for expenses that you are being reimbursed for by a client (customer). If you are looking to reimburse yourself or employees, please read this article Recording money the owners put into and take out of the business. There are two ways of recording these expenses in Kashoo. Because the reimbursable expenses are basically a short-term loan from you to your client, you may want to show them this way on the Balance Sheet; this is probably the most correct way to record them in terms of getting appropriate reports. Go to the Accounts page. When recording the reimbursable expenses paid, use this account instead of an expense type account (this increases the loan balance). Note: If you like, you can put the name of the client in the memo or description field so that you can search for it later if need be. Alternatively, you can set up a separate reimbursable expense account for each client, if you're looking to track expenses on a per client basis. The result is that the reimbursable expenses show up on the Balance Sheet only between the time you incur the expense and when you invoice the client for it, which keeps the books squeaky clean. Note: In order to keep your Reimbursable Expenses Receivable account in balance, you need to charge the customer the exact same amount as you paid. 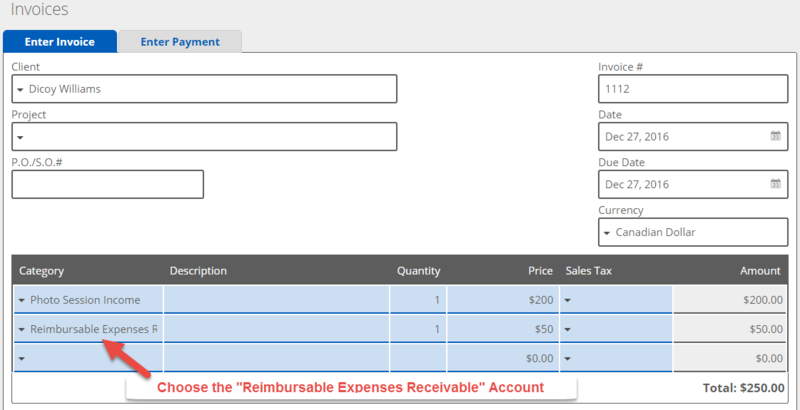 If you are adding an extra charge on top of the reimbursable expense, add this charge as another line item and use an income account (don't use your Reimbursable Expense Receivable account). Another common method is to simply record the expenses as your expenses, and the reimbursement as income. When you file your taxes the income and expenses cancel out, so if you are primarily doing accounting for income tax purposes this is a perfectly reasonable method. This also preserves your expense breakdown by category, in case you want to see where you are spending your and your clients' money. 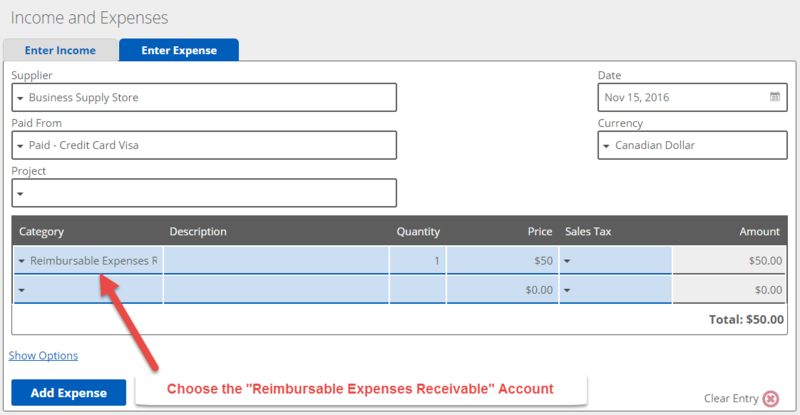 Create an income account called Reimbursed Expenses. Be sure to create a new expense account for any expense categories that are only partly tax deductible, like Meals and Entertainment; for example, create a fully tax deductible account called Meals and Entertainment - Reimbursable. Record any reimbursable expenses using your usual expense accounts, using the fully tax deductible version where applicable. Note: If you like, you can put the name of the client in the memo or description field so that you can search for it later if need be. When you create the client's invoice, add a line item for each reimbursable expense and use the Reimbursed Expenses income account. Since the final result, for tax purposes, is the same between the right way and the easy way, you can choose the one that seems the best to you. Note: If you are adding an extra charge on top of the reimbursable expense, unlike the right way, you do not need to add an extra line item for the charge. You can record all the income to the Reimbursable Expenses income account. When your client reimburses you for mileage, the situation is slightly different because the reimbursement doesn't correspond with any particular expense you have already paid; it's an abstraction for the ongoing expenses associated with owning and operating your vehicle. In this case, record the reimbursement as income. Create a new income account Reimbursed Mileage. Use this account when invoicing your client for mileage - the quantity is the number of miles or kilometers, and the price is the rate your client pays.